Not to be confused with Mecha Fly Guy. Fly Guys are Fly Guy toys appearing in Mario and Donkey Kong: Minis on the Move. Fly Guys are enemies found in the Fly Guy Grab minigame. In it, the player uses the stylus to aim and launch the claw on the bottom screen to hit the Fly Guys that appear on the top screen. 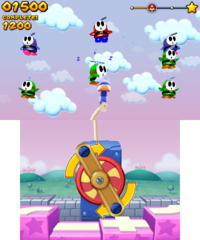 Green Mini Fly Guy, Blue Mini Fly Guy, and Gold Mini Fly Guy each appear individually in the Toy Collection. This page was last edited on March 8, 2018, at 15:12.